Last week in staff meeting my boss prayed for God to "move convincingly." I think he was referring to God's guidance and direction over all of us as we attempt to do His work through His ministry, however once he prayed those words I instantly began to try and grasp what that looked like and stopped listening to the rest of his prayer. If God is going to move at all wouldn't it be convincingly? Since then I've prayed for God to convince me of His presence and His plan with His movement over my heart and in my life. As with most prayers, I've come to realize the prayer is more about my being willing to be convinced then for God to actually move in a mightier way than He already is. I hope I continue to have a desire for him to move convincingly...big or small or however He chooses whatever the circumstance. The tough thing I've realized lately is what to do when God "convinces" me to just wait. My first thought, "LAME. When I pray for you to move convincingly I want big things, life decisions, ACT NOW!" Nope. He moved alright, and in a VERY convincingly manner. Just so happens that He has convinced me that it is ok to wait. Patience. I'm not convinced I'm ok with that yet, but I'm working towards it. Move Convincingly. Captivate us Father. I don't read. There are a few reasons why...but ultimately I would rather be doing anything else. When the Harry Potter books first came on the scene I didn't really think about it because I don't read. I liked the movies and was entertained by them, but I knew I would never read the books and wasn't all that curious as to what happened next. However, last labor day I was stuck in the car for hours driving to the beach with some HUGE Harry Potter fans. My friend Scott was reading the 4th book and in order to please the driver we began to read the book outloud. I was hooked. Hooked enough to go buy the 4th book (Goblet of Fire) the night we got back so that I could finish the last 3 chapters. I also bought the 5th book (Order of the Phoenix) at the same time because I knew I would be ready for it soon. The Order of the Phoenix might have been the first book I've read the entire way through in a VERY long time. All good things came to an end however and about 1/2 way through the first chapter of book 6 (The Half-Blood Prince) I knew I was done. I think it goes back to not being all that emotionally involved with characters...I'm not sure what it is. It's the same with TV shows, I can watch it one week and be ok with not seeing what happens the next week. I was fine to just stop going to Hogwarts and fine to give up on Harry and his quest to fight the Dark Lord. And so I did. ...until last week! All the friendships came back, Ron was still there being adorable, Dumbledore as wise as ever just waiting for me to return. What did it? Book on tape. I got to hear it, just like when I read it aloud. It was so much more real to me when I heard the story being told (granted I didn't agree with all the voices). We listened to it on the way to and from the beach. I continued to listen non-stop in my car and towards the end I would read the book when I was home and listen in my car. I finished the Half-Blood Prince on Friday night. Once again I was content to be done and not read 7. I was sad and didn't really want to know what happened next. UNTIL I GOT BOOK 7 ON CD!!! Thank you Sam Stephens for continually keeping my love of all things wizard-y alive. I was super excited and can't wait to continue story. Not a blast of hurry, touch the spirit there. Finding as He promised, Perfect peace and rest. last week I heard a commercial for Sharpie's new pen. Near the end of my college career I became slightly obsessed with sharpie's. Having been a Crayola snob all my life it was a hard transistion to make in some areas, but I found ways to love them both. 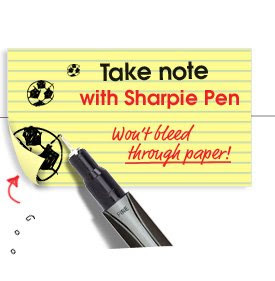 I was very intrigued by this new pen product from Sharpie. So I went and bought one. I was slightly disappointed at firtst as I am more the "gel" pen type person as opposed to the felt tip. However, it has grown me. I used it most of the weekend to journal, write notes, keep score, etc. Survery says: I like it! it's the first day of school for most kids in Tennessee. I LOVE the first day of school. New books, new school supplies, picking out the perfect first day outfit. I'm sad I don't get to partake. But thanks to Sharpie I now have a new set of fancy pens and feel just as excited today as any other student! I recently heard a friend tell me his woes of trying to find a birthday card for another friend. This is something I hear at least once every time I'm work at Hallmark. It's not just men either. People come in and have no clue where to begin. I do my best to help them, and most of the time we end up finding a good card. I thought that since there are so many out there who hate trying to find "the perfect card" I would share some of what I've learned about Hallmark cards with you. 1. Hallmark cards are first separated by "brands" or "lines" and then each brand section you will find the breakdown of a card for every occasion (for the most part). So there is not just one spot in a card store for birthday cards. There are birthday cards under each brand...and some brands are better than others. 2. The general Hallmark brand. This will be the largest section in the store and should have the greatest amount of choices for what you are looking for. However, this can make it very overwhelming. I typically will vote against looking in this section for birthday cards for someone you are close to. Though, for specific family members, anniversaries, or babies, this is one of the best places to look. 3. Shoebox. The Shoebox line of cards are probably the most popular. This is where you go for humor...humor for birthday, love, get well, miss you, etc. Some times it can be on the corny side but usually funny. Most are great for middle-aged people to give other middle-aged people, however they have recently come out with some current event cards as well as pop culture stuff...including the simpsons, that make it great for my generation. 4. Fresh Ink. These are my favorite. They came out 8 years ago and have continued to never disappoint. These are great, totally random, but also some sweet ones mixed in. Great for "just because" cards or cards for girlfriends (as in "where my girls at?! ", as well as actually girlfriends, AND girls that are just friends). They aren't mushy, or say too much. Most of the birthday cards are completely random and funny. Just be sure if you are mailing it to get the larger envelope so you don't have to pay extra postage. 5. Nature's Sketchbook. great for grandmother's or sweet women in your life. 6. Dayspring/Christian Expressions. Most of the time I find these fantastically cheesy. However, sometimes you really do want to send a scriptural card. I find these to be good for sympathy cards or for pastors, mentors, people going on mission trips, etc. 7. Journeys. This is the newest line of Hallmark cards. They are targeted specifically for those dealing with cancer or other serious illnesses. These are refreshing, honest, upbeat, and to the point. 8. Music Cards. I'm pretty sure these have changed the greeting card industry for good. There is everything: TV and movie theme songs, sound clips, current pop music, country, disco, oldies...everything. These are FANTASTIC...except for the price. At $5.45 (that includes tax...in TN) you might as well buy them a meal. However, these always bring a smile and make for great conversation wherever they are opened. Good for kid birthdays, or for just acquaintance birthdays, or even those you are really close to that just LOVE that song or movie. Sometimes the songs can be quite a stretch for the card, or it can be hard to find one that says the right thing (if you are looking for more than birthday) but overall I'd at least glance in this section if you are in the store. 9. (RED). Hallmark has started to promote the (RED) campaign with everything from greeting cards to wrapping paper. I really like these cards...they are funny, encouraging, clever, and uniquely designed. 10. general advice: give yourself time to find a good card, don't be afraid to ask for help, know your audience, don't just look in one spot or in one brand, AND always look at the bar at the top of the cards - it will be very informative as to brand and type of card. Oh Tim Gunn...maybe one of the top 3 reasons I have not yet gotten rid of my cable. Did anyone see last weeks Project Runway? Blayne - who is absotlutely bizarre and no where near being one of my favorites taught Tim to say, "Holla atcha boy!" Tim's response, "Holler at YOUR boy? What does that even mean?" To which Blayne gave the definition, "Ya know, like holla at ya dog!" Tim Gunn, "Is it Holler?" Terri's response, "No, Holla, H-O-L-L-A." Tim: "Holla"
As he exits Tim says, "Carry On. Make it work. Holla at your boy." Thank you Bravo and Tim Gunn for making me laugh almost daily!